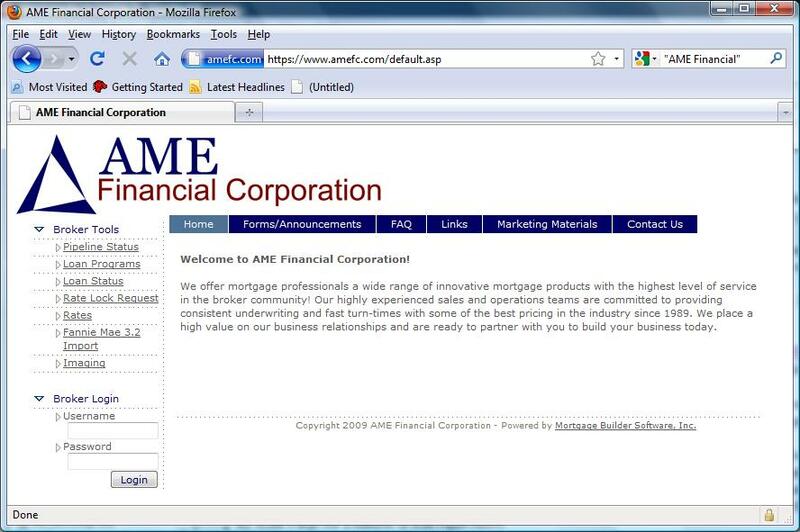 The Mortgage Lender Implode-O-Meter News Pick-ups: Imploded: AME Financial Corp.
"In retraction to the letter that was sent out Friday, October 30, 2009 effective immediately, AME Financial Corporation is ceasing the closing and funding of any loans currently in our pipeline. We apologize for the inconvenience and wish you all the best of luck." According to one source, some of the AE's were told "they can come back Monday as they will then be LendX employees." Sure enough, the web site for LendX sports many of the same names on its "Contact Us" page (view snapshot) as AME had on theirs the week prior. As a matter of fact, the two sites are practically identical in format and layout. The ratesheets for LendX bear some resemblance to those previously issued by AME (view pdf). Furthermore, we were prompted to accept a newly-issued web browser security certificate for www.amefc.com when accessing the site. 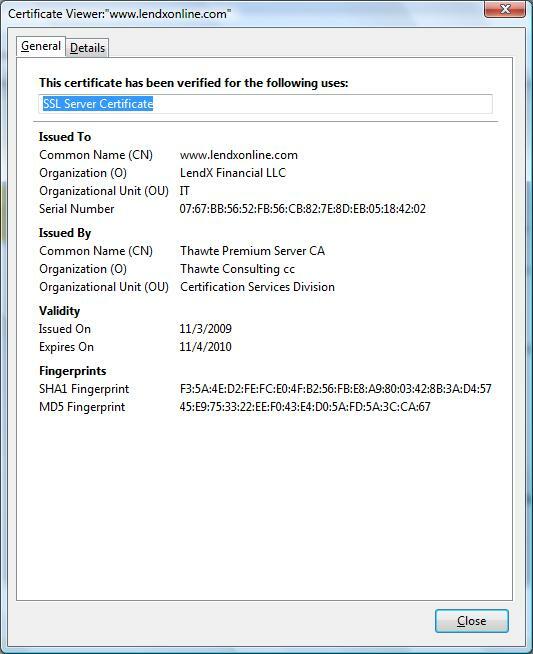 Turns out it was issued 2009-11-03 to LendX Financial, LLC. "I don't get it," one broker wrote. "By closing down AME they have cleared their pipeline." There are three other sexual harrassment lawsuits pending against AME Financial Corp., James Pefanis et al. Pefanis reportedly told his staff he was moving to Palm Beach. We're watching for more news. 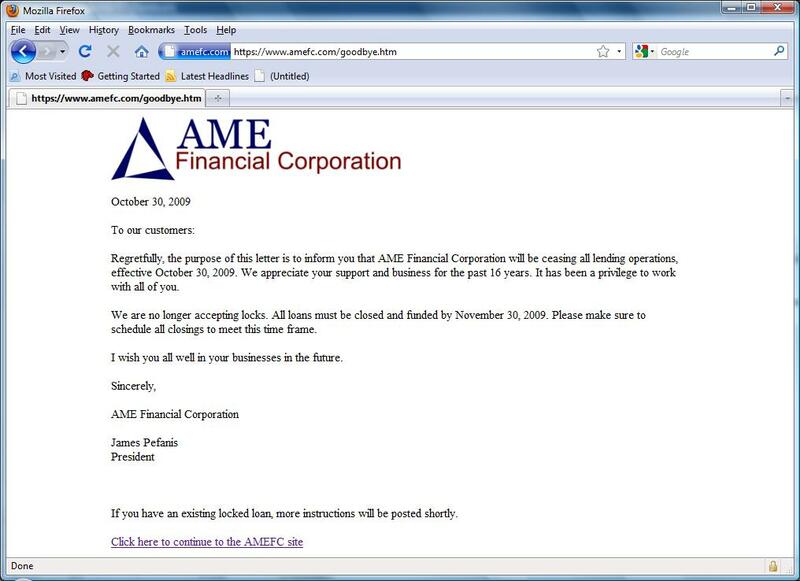 "Regretfully, the purpose of this letter is to inform you that AME Financial Corporation will be ceasing all lending operations, effective October 30, 2009. We appreciate your support and business for the past 16 years. It has been a privilege to work with all of you. We are no longer accepting locks. All loans must be closed and funded by November 30, 2009. Please make sure to schedule all closings to meet this time frame." AME Financial Corp. was primarily a wholesale lender, but they also had a small retail operation. CityTownInfo shows offices in Norcross, GA and Asheville, NC. When we called, the Norcross location said "today is our last day of business." The Asheville number was answered as "LendX." Originations overall in 2008 averaged more than $35 million per month. According to a former employee there were around 100 employees at the corporate headquarters in Alpharetta, GA. The web site (view snapshot) lists about 35 salespersons, inluding representatives in Denver, CO and Portland, OR. In a 2009-10-28 press release it was reported that AME Financial Corp. had "received notification from one of their main mortgage investors that they have been suspended from selling VA streamline loans or VA IRRRLS." That followed on the heels of a default judgement entered against CEO James Pefanis and AME Financial Corp. in a sexual harrassment case. As reported on Law.com, the judge in the case "determined that the defendants had presented as evidence a fabricated affidavit with the forged signature of a former employee." A jury awarded $9.2 million to the former AE on 2009-10-20. The company is also being sued by Wells Fargo for a number of loan repurchases. Register for free to add your comments below or email us with additional information.